Bose marked a new era in its home audio history with the launch of a new wireless smart speaker and two new smart soundbars— the Bose Home Speaker 500, and the Bose Soundbar 700 and Soundbar 500. The new Bose smart speaker and soundbars feature Bose’s proprietary mic technology, which has built a reputation through its commercial headsets and consumer headphones. With Amazon Alexa, they accurately detect voice commands the first time round wherever you are in the room, above party or ambient noise. The three products feature connectivity options such as built in Bluetooth, Wi-Fi, and Alexa, and deliver instant, easy access to millions of songs, information, entertainment, smart home control, and more. Bose Home Speaker 500 – features the widest soundstage of any smart speaker available today, delivering powerful, life-like stereo audio from a single device, with in-built Amazon Alexa, bluetooth and WiFi. Bose Soundbar 700 – engineered for performance and stunning design (wraparound metal grille and a gorgeous tempered glass top), providing exceptional detail and depth of music and dramatic realism for entertainment, with seamless connectivity via Amazon Alexa, bluetooth and WiFi. 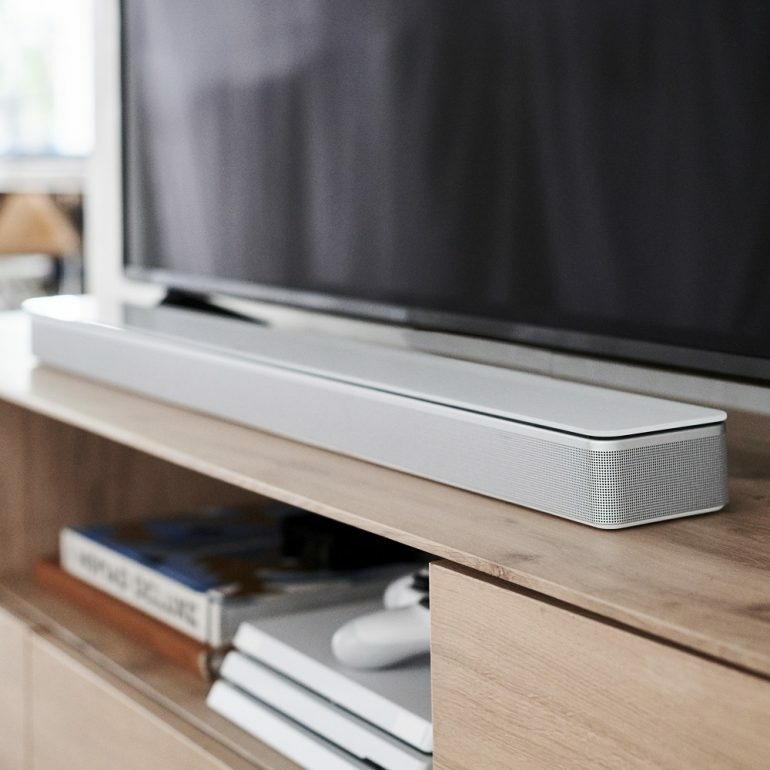 Bose Soundbar 500 – at 4cm high x 10cm deep and just over 78cm long, it’s smaller, thinner, and features a subtle matte finish to fit neatly under a television screen, while packing powerful surround sound and connectivity via Amazon Alexa, bluetooth and WiFi. They will be available in Singapore from September 21, retailing at S$599 (Home Speaker 500), S$799 (Soundbar 500) and S$1,199 (Soundbar 700) at authorised Bose dealers. August 29, 2018 – Today, Bose begins the next chapter in its legendary home audio history with a new wireless smart speaker and two new smart soundbars— the Bose Home Speaker 500 for music, and the Bose Soundbar 700 and Soundbar 500 for music and home theater. Each crushes the limitations of spaciousness from a single enclosure, combining size-defying performance with superior voice pickup and the power of Amazon Alexa now, other voice assistants to follow, and AirPlay 2 for simple streaming from Apple devices added in early 2019. Engineered from the ground up, the new Bose smart speaker and soundbars use the proprietary mic technology found in Bose headsets and headphones to hear commands better over louder listening levels. With Bluetooth, Wi-Fi, and Alexa built in, they deliver instant, easy access to millions of songs and tens of thousands of skills for information, entertainment, smart home control, and more. They work brilliantly alone or together as a multi-room system. And they’re all available beginning September 21 2018. The Bose Home Speaker 500 has the widest soundstage of any smart speaker available today. It’s wrapped in seamless anodized aluminum, is a mere 20cm high x 15cm wide x 10cm deep, and uses two custom drivers pointed in opposite directions — so sound reflects off surrounding walls, separating instruments to the far left and right, and placing vocals where the artist did. The result is powerful and lifelike — without artificial effects or distortion. And when touch control is preferred, or the phone is out of reach, there are buttons for basic functionality located right on top.